Hasbro has a history of producing quality licensed toys - especially for the Star Wars franchise. Its range of action figures, for the Star Wars: Revenge of the Sith collection, carry on this tradition and ensure that the latest generation of Star Wars fans get some of the best quality figures on the market. 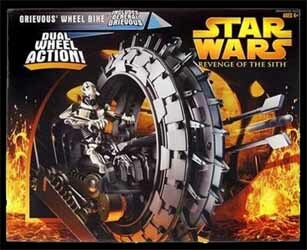 The Grievous' Wheel Bike comes complete with a General Grievous action figure. This vehicle can be used by rolling it around the floor, or fold-down its legs for walking. It also comes equipped with adjustable claws and well as a blaster that launches a missile. The attention to detail that has gone into both the vehicle and the action figure is impressive - although I have to admit to not actually being a fan of the design that was used in the movie. 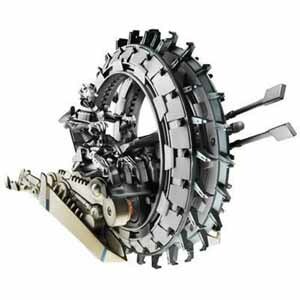 Anyone who has seen Steamboy will recognise the basic design when it is in "bike mode", but when it's legs come out it looks not unlike a bizarre Swiss army knife. For the price you really can't grumble - you get a lot of toy for your money. Star Wars fans will not be disappointed by this well manufactured toy.